My human and I have some fun things planned this week, but first I wanted to share some fun outtakes from the past few weeks. 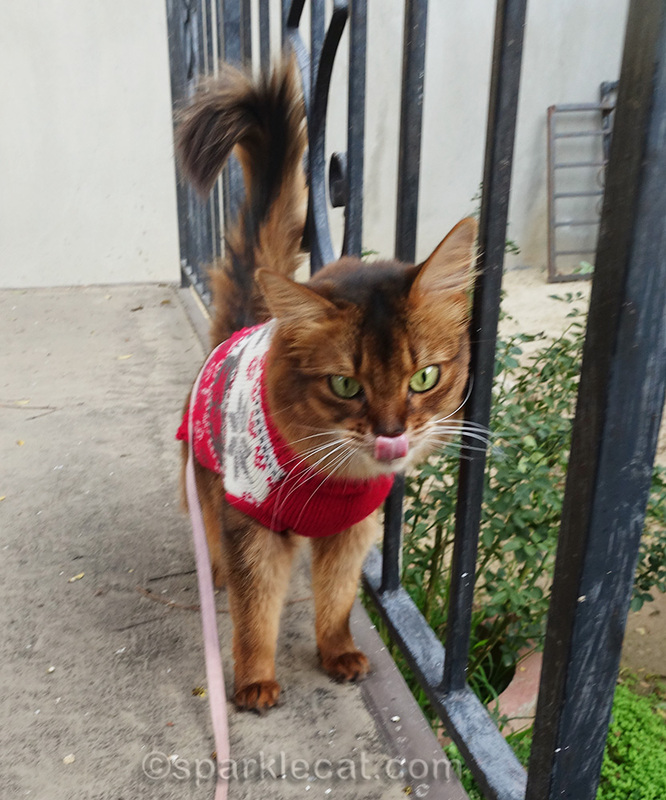 Considering that my human was out of commission for nearly half that time, it’s pretty amazing we have enough for a whole blog post! 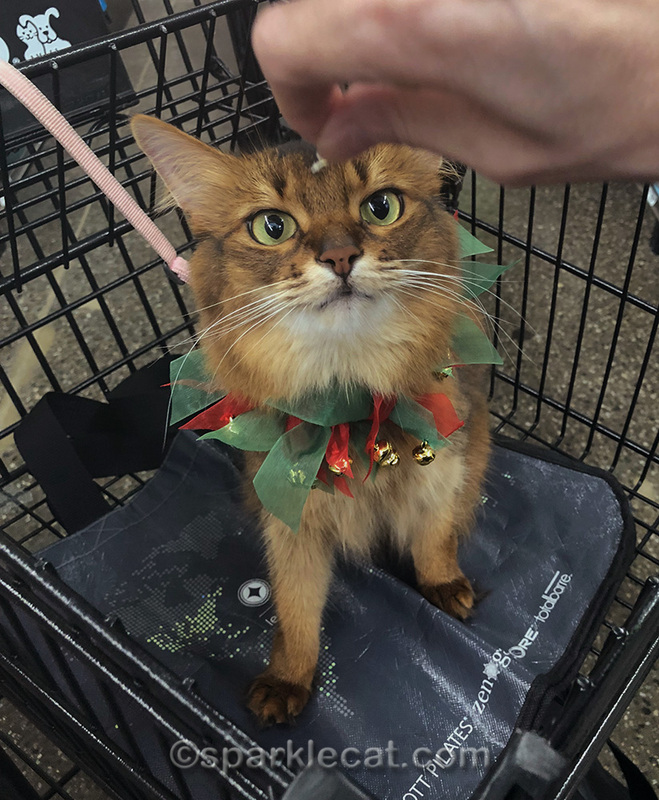 I’m starting off with the photo above from my Santa Claws visit, in which my human carelessly got her hand (and treat) in the frame. 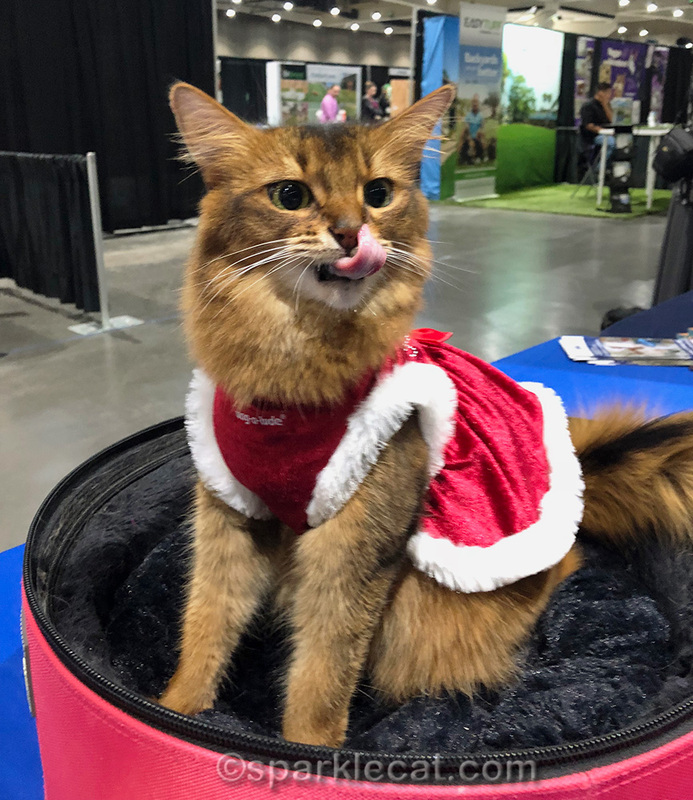 Here’s a photo from the WAG Petcon, giving out raspberries to go with the TICA pamphlets. 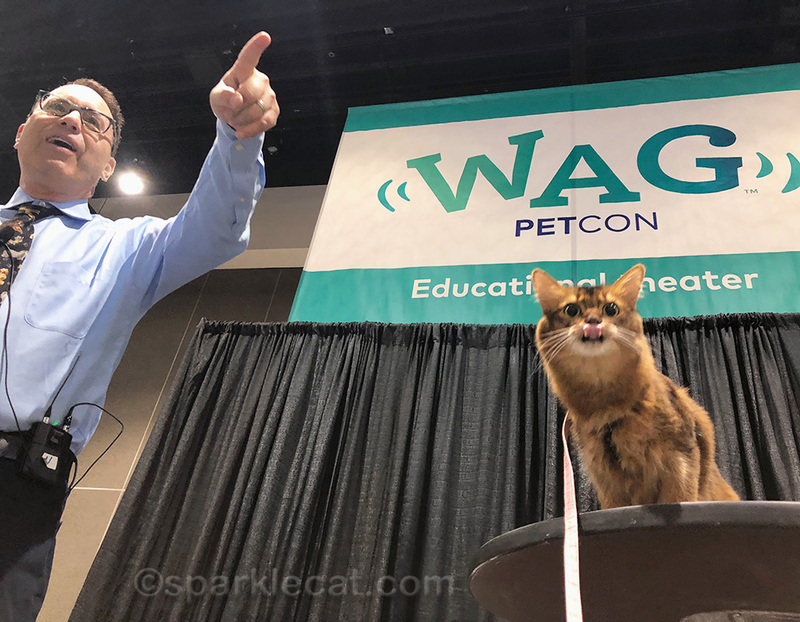 This is my favorite outtake from the WAG Petcon, because it looks like Steve Dale is pointing at someone, and I am giving them a raspberry! My human even managed a few outtakes during my outside photo shoot a couple of days ago! This one is the best of the worst. 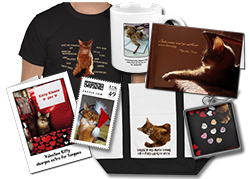 This one isn’t really an outtake, just a quick photo my human couldn’t seem to find a use for. She couldn’t resist snapping a picture of me and Boodie napping together, since it doesn’t happen very often. I’m sure a lot of you Boodie fans out there will appreciate this photo. I hope you enjoyed these! If you have a favorite, let me know in the comments! Whoa! That last photo shocked me. I don’t think I’ve ever seen you in a gentle moment with any of the other cats. It’s like you’re completely above them. Loved these pictures. Full of fun…. Of course, our fave is the last one, Summer. You two look so sweet together! I love the photo of you napping with Boodie!!! Happy Mew Year! That last photo with Boodie is too sweet! And you and Steve Dale look like best pals! The one with the announcer guy was pretty great! Love the picture of you and Boodie napping together. Love the tongue, too! Summer, you are just too cute! Fun read on an otherwise gloomy day. Summer, you have your tongue stuck out in most of these photos, which is very cute actually! I do like that photo of you and Bodie. I look forward to seeing more. Lots of great photos so it is hard to pick a favorite. I enjoy seeing you and Boodie but I have to say my favorite is the one with Stephen Dale. That’s how kitties sleep together, when they like each other!! MOL MOL Summer The Christmas Story is a must see every year here. The duck cracks me up every time. Cute photos. Nice to see you and Boodie cuddled together. Iâ€™m always happy to see Boodie, but whereâ€™s Bing-Binga? I just enjoyed the videos again! THAT was fun. You and Boodie sleeping was my total fave. What a fun way to start the year. We especially love the one of you and Boodie. Yes, yes – we do love to see Boodie! big boodie fan, and i love that pic. 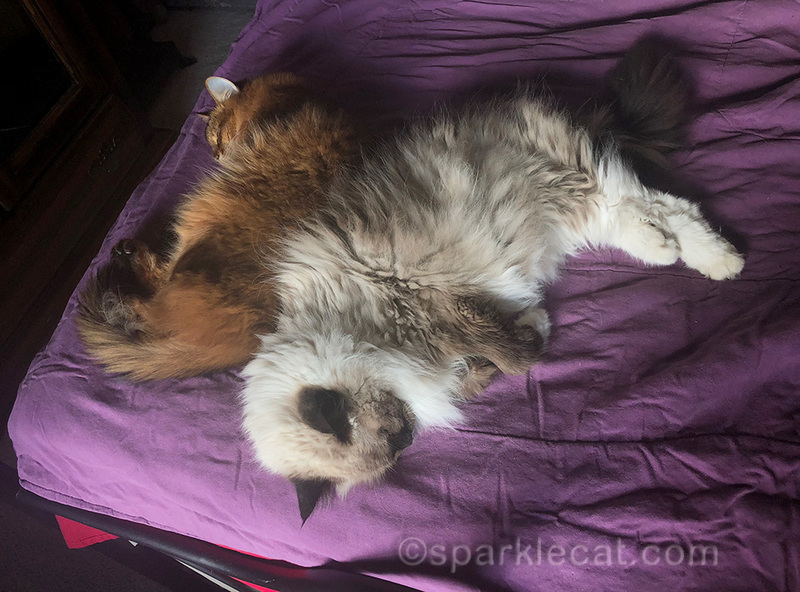 We love, love, LOVE the photo of you and Boodie napping together! Those are terrific sweet Summer and you started 2019 off with smiles here! We enjoy your outtakes. You and Boodie together is cute. petite than Boodie.) . You in the Santa dress is 2nd fav. Great outtakes. Love seeing Boodie.